According to estimates from the Howard Hughes Medical Institute, somewhere around 7% of men and 0.4% of women are color blind. The most common is red-green color blindness. I always wondered whether the presentation rule of “never use red” in a presentation was true. So, I spent the a few hours on the website www.vischeck.com to find out. Vischeck.com lets you upload images to see how they would appear with different types of color blindness. 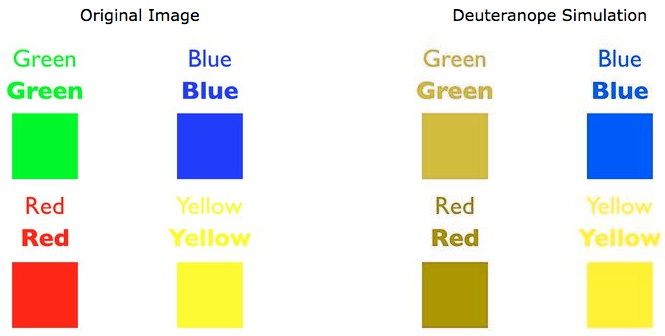 So, we can’t tell yellows from reds and greens, but we can still see the BOLD effect in the words clearly. These first two are from a lecture I developed before abandoning red altogether. I was very disappointed to find out my orange (2nd pic) suffered the same fate as red. Here is the effect in some of my more recent slides.